This week in Germany, there was an attempt to break the Guinness World Record for the largest meeting of people in Smurf costume. Within the article it says that 2762 people dressed up like smurfs, all of them had to cover all traces of skin in blue paint, and don the signature curved hat. Which made me think was there a Devil smurf within the crowd? When Devil Smurf was first released into the USA by Applause in 1985, it had its skin painted orange for some reason. It was released as part of the Limited Collector Series set and was released with Angel Smurf. They were released with the names of Conscience Angel and Conscience Devil Smurf As this version Of Devil Smurf was only sold for a short period in 1985, the orange painted Devil Smurf is generally harder to find. 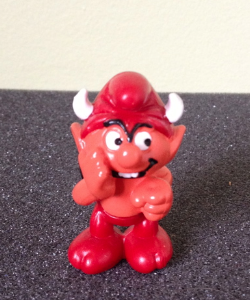 Devil Smurf was also released by Schleich in 1985 and was sold for 24 consecutive years. Little changed with the mould over the years but the colour of pink pvc material did vary slightly and also the red paint used on it’s trousers and hat can vary. Devil Smurf was first made in W.Germany then China and lastly Germany. It is also possible to find the Devil Smurf with a black paint dot or a blue paint dot. The black paint dot was used between 1988 to 1999 for smurfs painted in Portugal and Tunisia. The blue paint dot was used between 2001 to 2004 and were typically from China. 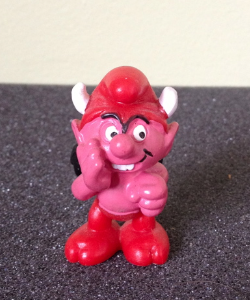 The most sought after Devil Smurf was a specially produced one for the 2014 World Cup Soccer tournament. The Belgium Soccer team has often been referred to as the devils. This devil is made of a red material and painted pink and also has yellow horns. It has the markings Made in China Am limes 69 D-73527 Schw. Gmund Schleich S © 84 Peyo CE with a timestamp. Schleich has given this article number #82917. So was there any devil smurfs within the crowd trying to break world record? You would have to say each of them a little bit devil smurf in them.